And it was about this time that Shark slapped his idiotic sidekick across the face. Whereupon they all plummeted to their deaths due to the ship lacking anything besides “gravity-directed descent” mode. 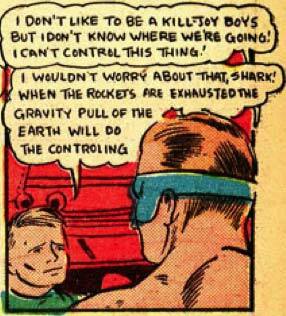 Next time on Amazing Man, Shark and his sidekick get the bad end of a Rocket as they find an amazing flaw in their “Gravity” plan.